SIX = 6! AND ALL YOUR BASE ARE STILL BELONG TO US! Ah! Suddenly trigonometry m akes sense. the reason why einstein didnt comb his hair. im sooooo doin this for the leavin..who knows the examiner might get a laugh out of it! Math, braincrackingly easy since 500 B.C. ! 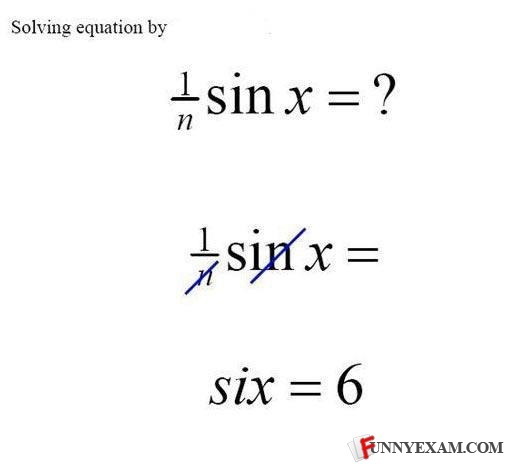 sin(x)=n or x=arcsin(n) It can't be solved more than that. Well, that's one way to do it, I guess. At least he simplified the equation! If such is the case it's always 6! *explanation* in maths, there are some cases that numbers are canceled out so that it will be easier to solve a problem. In this case, the student canceled out letter "n" >> both "n" become 1. therefore, now it has "1 over 1 and multiply by six"= 6 this is not right in theory, but it's very smart and funny.. The Game. You just won it. All your base are belong to the student who simplified that fraction, no, tangent! Clever but obviously fake. Paint exam is FAIL. GIVE THIS STUDENT SOME ICE CREAM PRONTO! FUCKEN GENIOUS! I`VE NEVER LAUGHED SO HARD! (1/n)sin x (1/n)sin x (1/n)sin x =? What's worse than breaking your neck on a trampoline? Getting in a car crash on the way to the hospital.